The world is worrying about nuclear weapons more than at any time since the frightening days of Reagan and Brezhnev, and with good reason. 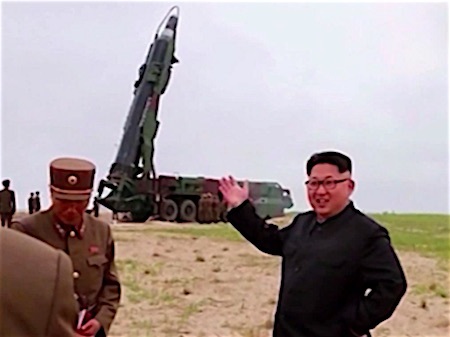 We are all hoping that Kim Jong-un (right) is rational with no ambition for suicide. And at the same time, we are reduced to hoping that the American military will constrain Donald Trump’s impulses to reach for the nuclear launch button. Leading politicians in South Korea and Japan are talking up the need for their own nuclear weapons, and Donald Trump is not saying no. So, it’s hardly surprising that 122 countries voted at the United Nations in July to pass the Treaty to Prohibit Nuclear Weapons. Rather more surprisingly, but gratifyingly, the 2017 Nobel Peace Prize has been awarded to the Melbourne-born International Campaign to Abolish Nuclear Weapons (ICAN) for its work leading to the nuclear ban treaty. At root, building more nuclear weapons and banning nuclear weapons are the two logical opposite responses to the fact that there are still thousands of nuclear weapons on hair-trigger alert. With sober-minded experts putting the chances of war in Korea at 50/50, any thought of war with 75 million Koreans living in an area the size of Victoria is horrific, even if, by sheer dumb luck we avoid escalation to nuclear war. Pine Gap will be central to US planning and operations for a Korean war, nuclear or ‘conventional’. 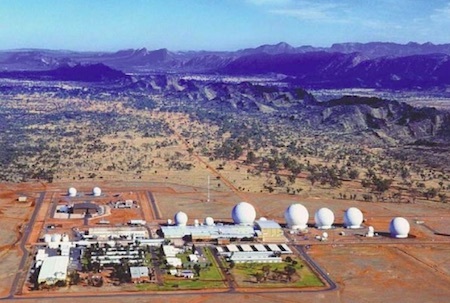 Pine Gap’s longstanding primary nuclear role involves its ‘big ears’ in space and on the ground providing the locations and characteristics of enemy radars and air defences, the better to evade, jam, or destroy them as a prelude to airborne nuclear attack. Pine Gap’s secondary nuclear task involves its infrared satellites detecting enemy nuclear missile launches, giving the US a few minutes of warning of the country’s descent into hell, and moments for a last presidential decision about firing its thousands of missiles in return. Those same infrared satellites have two more nuclear war roles. Pine Gap detects which enemy missile silos have been fired and which have not, and are therefore to be targeted in a US second nuclear strike. And when Pine Gap detects the first seconds of missile launches and calculates the missiles’ likely trajectories, it passes the information to the US missile defence systems, cueing their fire radars to search a tiny portion of the sky where the missiles are gathering enormous speed. Cued by Pine Gap, and if they work as the Pentagon and the arms manufacturers advertise, US missile defences might, just might have a chance of firing their own missiles to hit and destroy the enemy missiles. Without Pine Gap’s contribution, the chances are probably about zero. In case the word ‘defence’ in missile defence provides some degree of comfort, consider the counter-intuitive effects of the US missile defence system for a country like China, without a comparable system. Missile defence on one side of a pair of countries with nuclear weapons pointing at each other is like one person coming to a duel in Kevlar armour, and the other being ordinarily clothed. Not surprisingly, China has moved to modernize its nuclear weapons systems and platforms to counter the threat of ‘missile defence’, even before the US spends a trillion dollars to modernize its nuclear arsenal over the next 30 years. The nuclear ban treaty is a rebellion by the majority of the world’s governments in the face of half a century of empty promises by the nuclear weapons states. 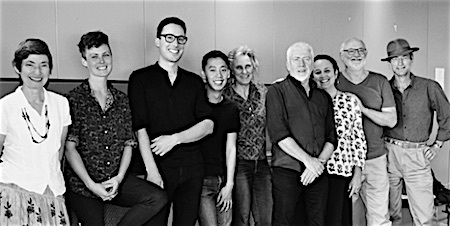 Right: The ICAN Australia board, Prof. Richard Tanter second from right. The treaty strategy is clear and clear-headed. By passing a law to prohibit the use, using, testing, developing, producing, manufacturing, or stationing nuclear weapons – or assisting any of these activities – these countries are saying to the nuclear weapons states that what they are doing in their ‘self-defence’ is utterly illegitimate and criminal. It is hardly a surprise that all the nuclear weapons states boycotted the treaty negotiations. The US warned their nuclear-supporter allies like Australia, which had been playing an enthusiastic spoiler role in the run-up, to not take part. Already the existence of a law to which these nuclear states and nuclear-supporter states are not party is having its key planned effect – to set a global norm of international legitimacy which stigmatizes those who hold the threat of nuclear war over the rest of the world. Critically, it forces the defenders of nuclear deterrence to justify themselves, to try to refute the scientific evidence that any use of nuclear weapons will be catastrophic, that a ‘limited nuclear exchange’ will cause abrupt climate change with decades-long global humanitarian consequences and famine, and that as the Red Cross says there is simply no conceivable effective medical response to even a single detonation of a nuclear weapon in a city. Most importantly for Maralinga and the nuclear sacrifice zones of the Pacific, the treaty also provides for assistance to nuclear weapons survivors and for the remediation of nuclear test sites. ICAN Australia was determined that nuclear survivors from Japan, Australia, the Marshall Islands and French Polynesia would get to the treaty negotiations, to bring a sense of the lived experience of nuclear weapons to the diplomats, skilled and determined though they were, coming from very different worlds. Karina and Rosemary Lester, Sue Coleman-Haseldine and other Pacific nuclear survivors brought indigenous voices and the experience of nuclear colonialism to the heart of the talks, with great effect. And now, a Nobel Peace Prize to ICAN, which started in Melbourne, and grew into a global coalition. Pretty amazing, and so wonderful for so many people well beyond ICAN. Here in Australia, the next task is to get the ALP to pledge to sign the ban treaty as soon as it takes office. And then, before we can ratify the treaty, the two struggles to bring Australia into compliance will begin. The first is to abandon the bipartisan commitment in our defence policy to reliance on US nuclear protection – the extended nuclear deterrence policy. The second, of course, is the reform of Pine Gap to require the removal of all nuclear-related activities from the base’s operations. Whether that demand would lead to genuine reform or a US decision to close the base will depend on whether an Australian government can develop a spine and require the US to comply with new international law. Richard Tanter is chair of the Australian board of ICAN, awarded the Nobel Peace Prize in 2017, and with the late Des Ball and Bill Robinson has published eight research papers on Pine Gap with the Nautilus Institute. He is also Honorary Professor in the School of Political and Social Sciences at the University of Melbourne, where he teaches graduate and undergraduate subjects on ‘Nuclear Weapons and Disarmament’, Indonesia Rising?’ and ‘Australian Foreign Policy’. Australian government require the US to comply with new international law? The Australian Government is almost 100% subservient to the US. There is no better illustration of that than Pine Gap. Few other countries in the world would allow such a war waging facility on their soil. Even fewer would allow it to be positioned down the road from a town like ours. The hope is that our servitude will protect our nation. It is entirely possible that we residents of Alice Springs will be the collateral damage. Richard Tanter’s views as an ICAN expert in his field of nuclear warfare and the danger of the US virus to Australia’s health are interesting. It is a bit like the different views of experts in euthanasia, the debate of the moment down here in Mexico. I have been a big fan of the good Dr Richard Lim since the 1980s. The question is, do we keep the palliative care going at Pine Gap to help the Yanks stay one step ahead of the North Korea rogue viral infection, or do we de-nuclearise Pine Gap and keep our fingers crossed that North Korea will look kindly on us when the Yanks are wiped and Kim Jong does not take us off life support.